Simultaneous with the increases in global sea surface temperature, increasing atmospheric carbon dioxide (CO2) is driving changes in the chemistry of the oceans—a process known as ocean acidification. Over the last two decades, reef-related ocean acidification research has focused primarily on the consequences of elevated CO2 on calcification. The impacts of ocean acidification on other critical processes such as coral-algal symbioses and bleaching thresholds are less well known. 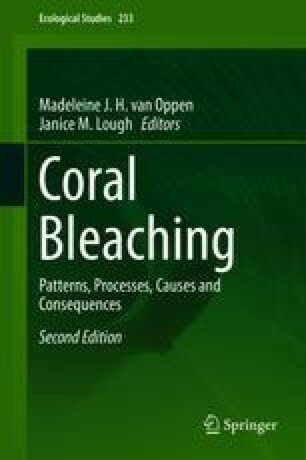 In this chapter, I review the available literature on the impacts of ocean acidification on coral bleaching. I begin by providing context for ocean acidification and its impacts on coral reefs. I focus primarily on primary literature investigating the effects of CO2 on photophysiology, coral–algal symbioses, and bleaching responses while shedding light on information needs and unresolved issues. I also briefly touch on environmental factors other than temperature and ocean acidification that have the potential to influence coral bleaching responses (e.g., nutrients).